Magnum will release their latest album entitled Sacred Blood “Divine” Lies on February 26. It’ll be issued via Steamhammer/SPV and is the follow-up to 2014’s Escape From The Shadow Garden. 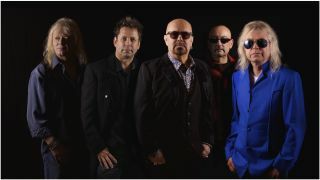 Guitarist Tony Clarkin wrote 25 tracks for the album and cut the list down to 10 for the record, with a further three included on a bonus DVD which will be bundled with the disc. The album will be released in digipak/DVD, 2LP coloured vinyl, CD and digital formats and is available for pre-order. The cover was illustrated by longtime Magnum collaborator Rodney Matthews. The band will head out on tour next year and have announced an initial run of shows with more to be confirmed.